Home > Wireless irrigation monitoring systems, why make the switch? Wireless irrigation monitoring systems, such as those from Orbit Communications are becoming increasingly popular as they eliminate the need to physically check every irrigator located on a property. 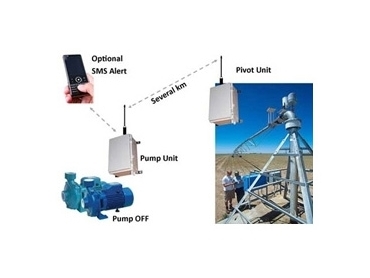 Wireless lateral and pivot monitoring irrigation systems from Orbit Communications operate by monitoring pivot or lateral irrigators and then sending the relevant information back to water pumps. This means that property owners can devote their time to other important tasks as they do not have to regularly drive back and forth to each irrigator in order to monitor to them. Because the irrigation monitoring systems observe each irrigator on a constant basis, they detect problems much faster than manual monitoring, and they are able to immediately switch the necessary water pumps off when a problem arises. This ensures problems are detected as soon as they arise, and prevents further damage from occurring. The irrigation monitoring systems are available with a GSM/Nect-G dialler. This feature allows them to send an SMS to five different phone numbers, alerting those who receive it that a problem has been detected in one of the irrigators. This ensures property owners are informed of the problem almost immediately, which enables them to fix it as soon as possible. The irrigation monitoring systems are able to keep the water pumps turned off until the problem that has been detected is effectively solved, which prevents further damage. Then wireless irrigation systems from Orbit Communications are for you.